Spun Sugar Chock Paint Project | Am I Blushing? I tried a new paint. It’s Miss Lillian’s No-Wax Chock Paint. 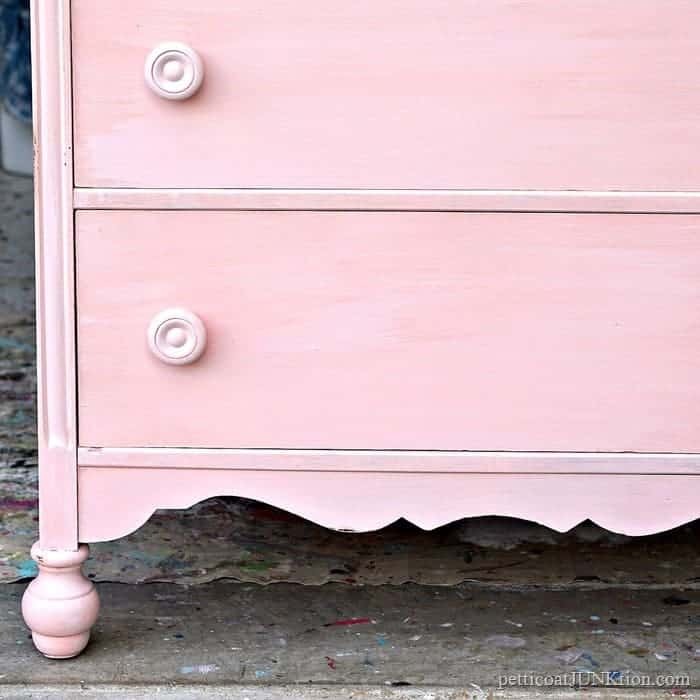 The paint colors are so darn pretty and I happen to know the creative lady behind the paint. Her name is Marilyn and she sells the paints at the shop where I have a booth. 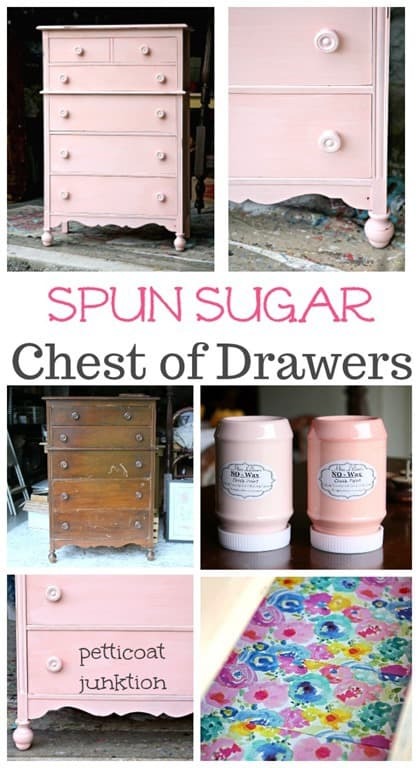 I absolutely love how this chest of drawers turned out. It is darn pretty too. Patting myself on the back and doing the happy dance. 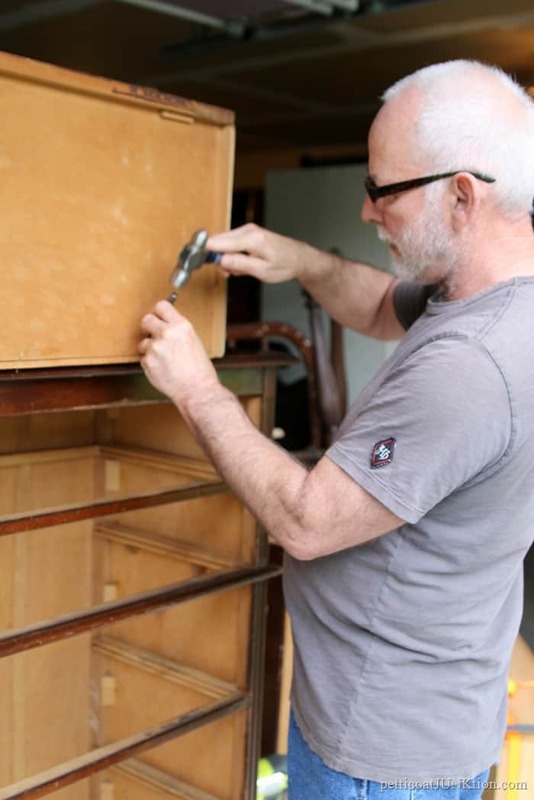 Today is Furniture Fixer Upper day and my friends have some fabulous projects to show off. Links at the bottom of the post. Let’s talk about my project first. I paid more for the chest of drawers than I normally would but I simply love the feet and the knobs. I don’t know what it is about those wood knobs but they get me every time. I looked at this piece several times over the course of a few weeks before I bit the bullet and bought it. The cost was $75. The chest of drawers needed a bit of work too. Plus it was really dirty. I used the shop vac to remove what I could of the dust then I used a wet rag and Simple Green to finish the job. 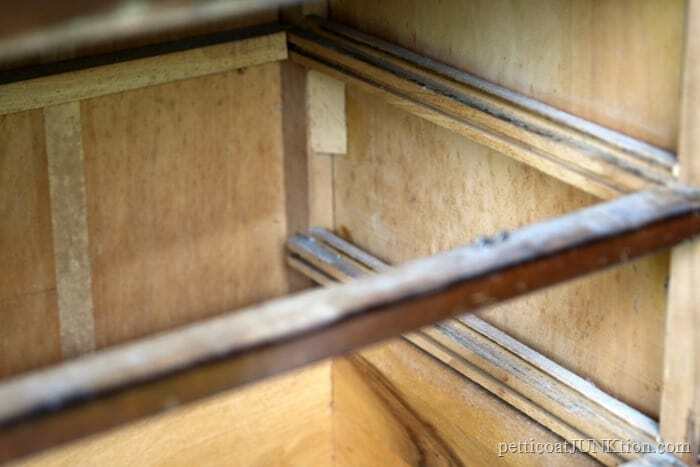 Some of the drawer bottoms were out of alignment and were held in place by an abundance of nails. The JTS fixed everything up for me. 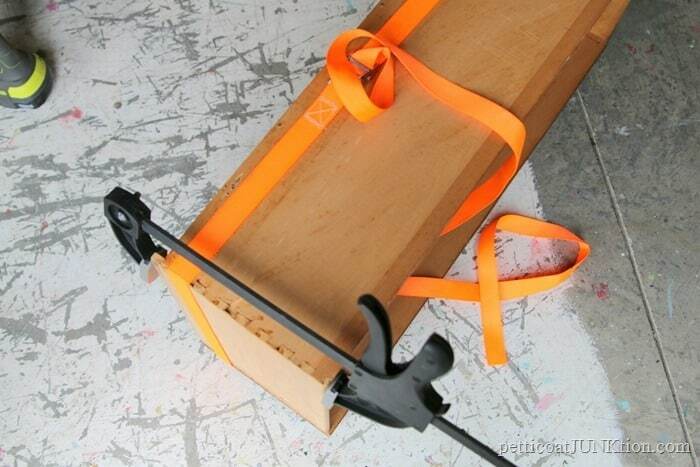 A few of the drawer joints were loose and we used wood glue and clamps to fix those up. 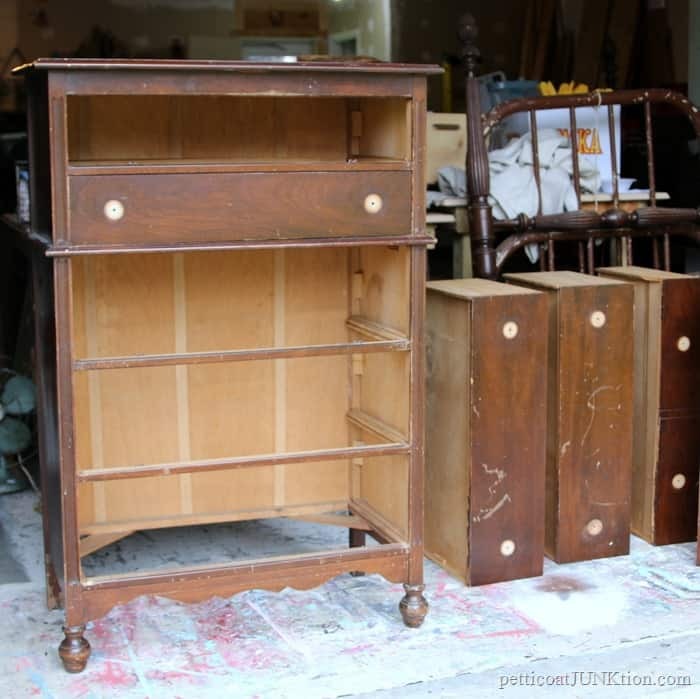 Once all of the repairs were made I removed the wood knobs and set the pieces on a drop cloth…..ready for paint. 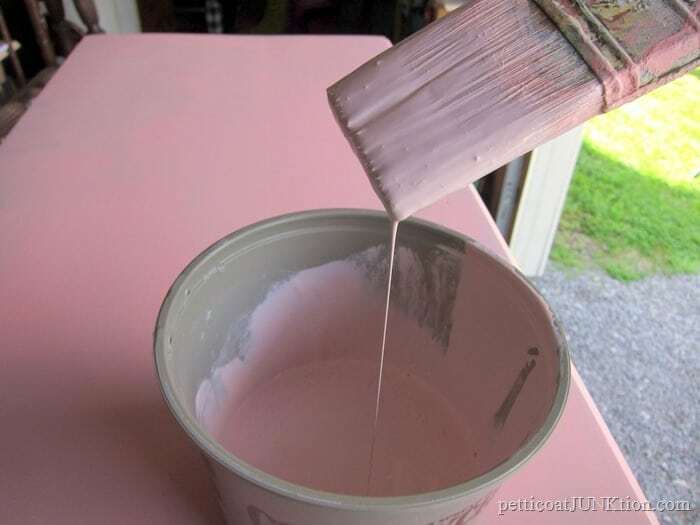 The two colors of Chock Paint I used for the makeover are Blushing Cheeks (the darker color) and Spun Sugar. 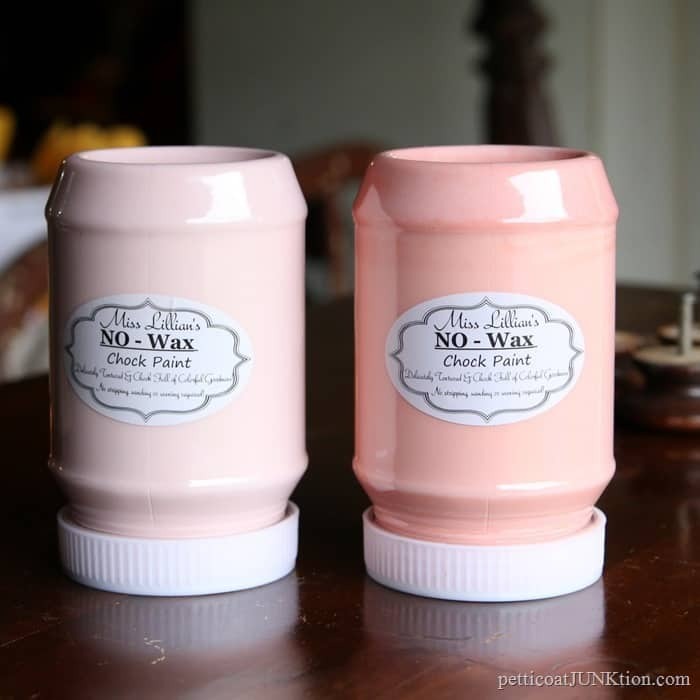 For those of you asking about the name of the paint….Annie Sloan owns the trademark to “chalk paint”, therefore if someone else uses that term they can be sued. This is how everything looked after one coat of paint. I’ve found that usually pinks and sometimes reds don’t cover very well. 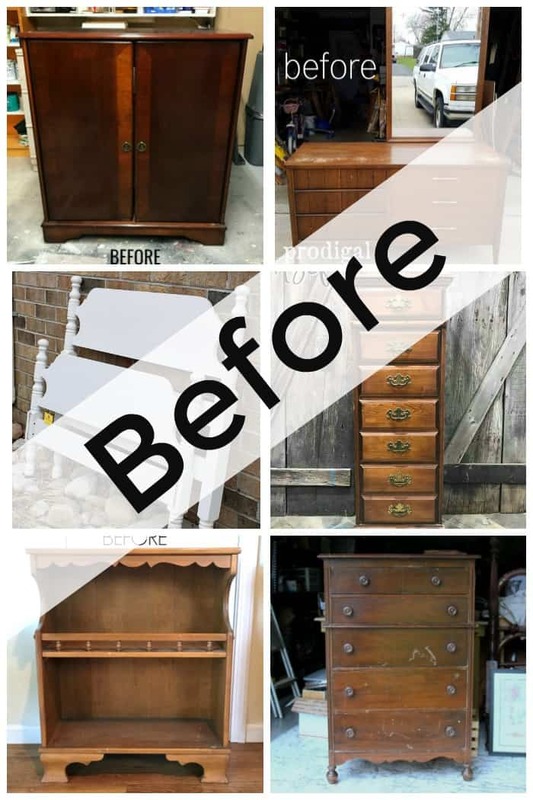 For this makeover I had to use 3 coats of paint to cover the dark wood. But I didn’t stop there. I added water to the Spun Sugar color…..ratio of water to paint about 1:3. I didn’t really want to use the mixture as a wash, which would be much thinner. I wanted to heavily dry brush the Spun Sugar over the Blushing Cheeks color. I brushed lightly over the darker color not painting over the entire surface. You can see what I mean in the above photo. The Spun Sugar was still wet in this photo. It dried darker and blended in. 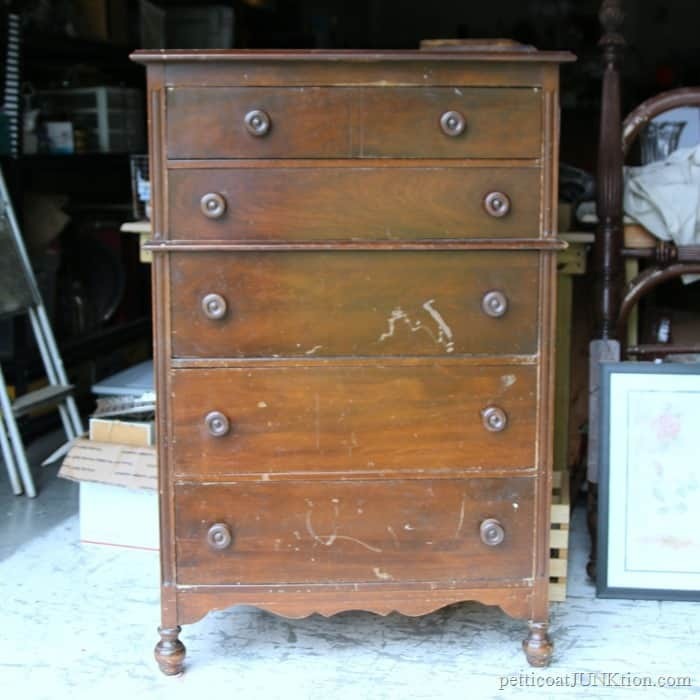 I used a heavier coat of Spun Sugar on the knobs for better contrast between them and the chest. I really love those knobs. 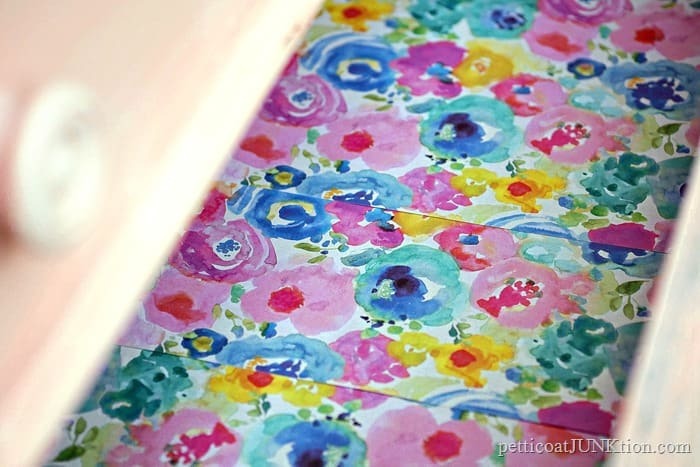 The pretty girly chest of drawers called for some bold scrapbook drawer liner……found at Hobby Lobby. You might notice that I did a very little bit of distressing. I mean just a tiny tiny bit. Just a few areas here and there. I can’t tell you guys how happy I am with this makeover. 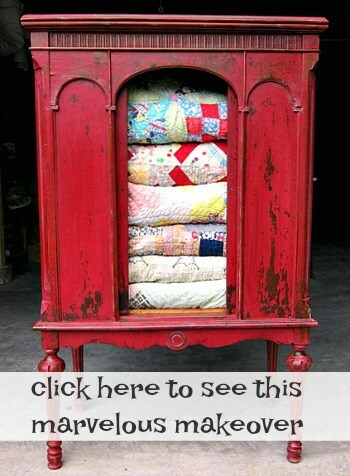 It isn’t over the top gorgeous or an outstanding piece of furniture…..I just like it. I bought the chock paint myself and this is not a sponsored post. 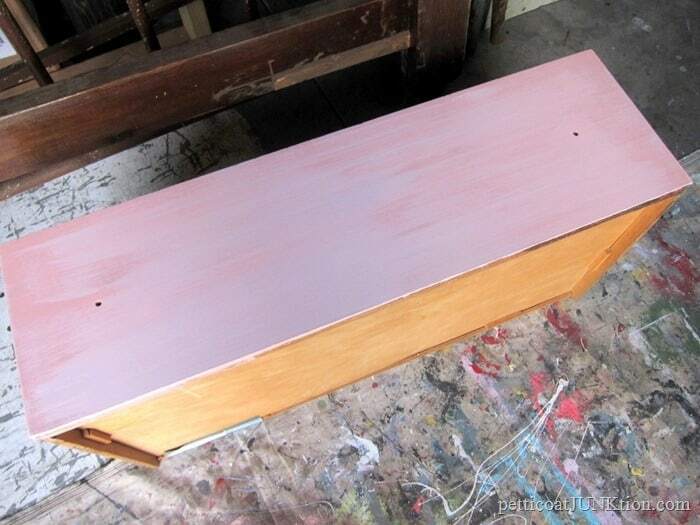 I like the paint and I’ll probably try another color in the hopes that I don’t’ have to use 3 coats of paint. As I mentioned it was probably the color over the dark wood. I didn’t use a primer and the paint didn’t need it. The sheen is not flat and not satin. Kind of in between I guess. And as the name says…..no waxing. Gotta love that. 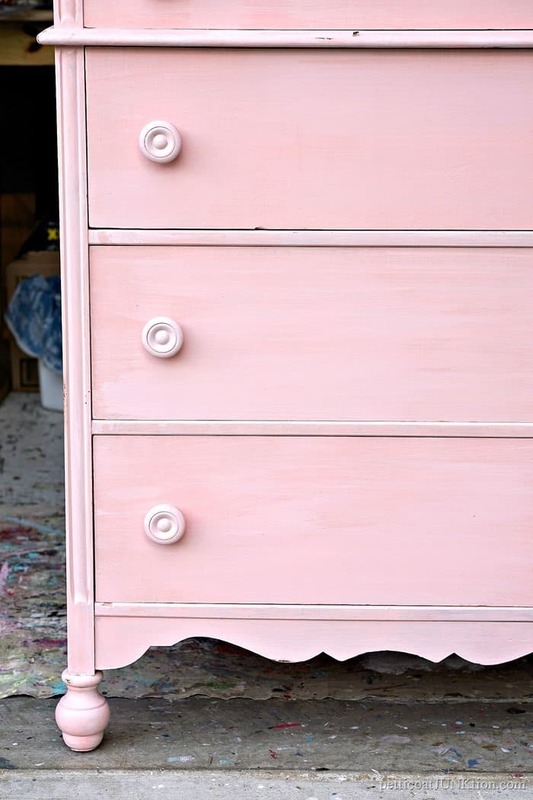 Let me know what you think of the project and take the Furniture Fixer Upper Tour by clicking the pink text links under the “before makeover” photo. Surprising makeover, I would have never guessed it was painted. Looks like something I’d purchase from a store it looks so good! So pretty! I will definitely have to try that paint. 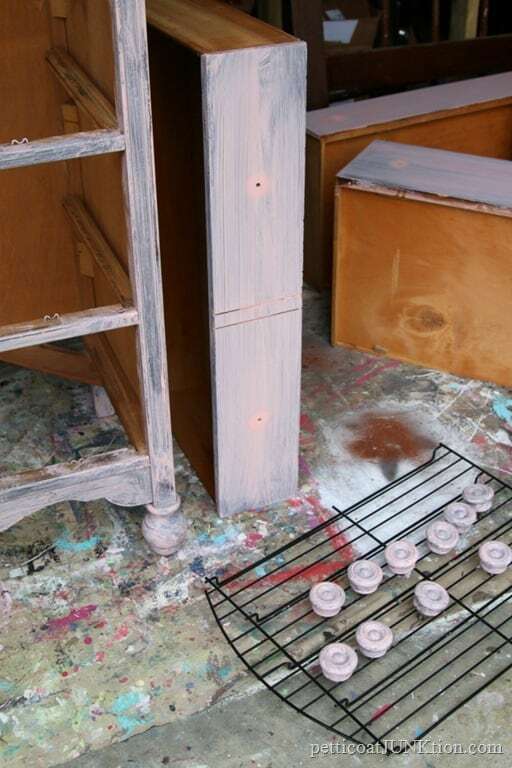 I love chalk paint, I hate the waxing. Kathy, this is adorable! 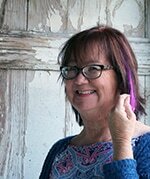 Love the color – reminds me of cotton candy at the county fair in summer. We were both thinking “girly” makeovers this month. I LOVE it! Some young (or old!) woman will be crazy about it, I know! Just gorgeous! This is so beautiful! I have to have something in that color! Very pretty, love the layered look with the two colors. 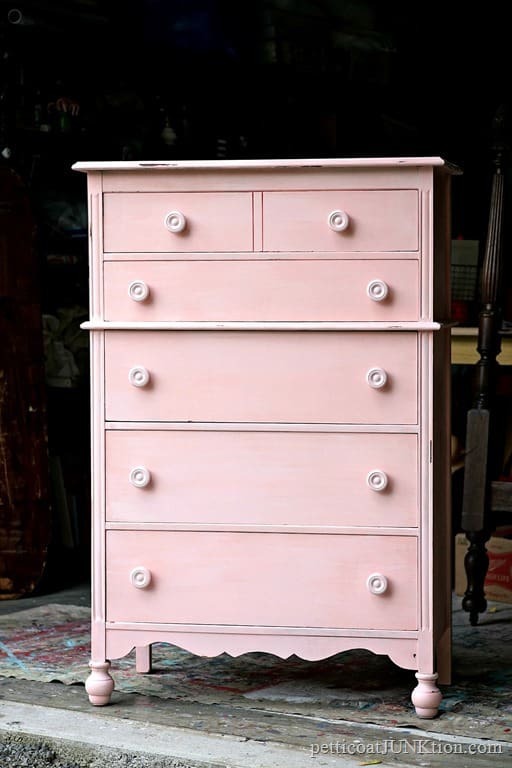 Beautiful chest of drawers, and your paint job made it shine. Gorgeous! It’s very pretty. I do wonder why she spells her paint line “chock,” instead of chalk, though. Hi Lizzy! 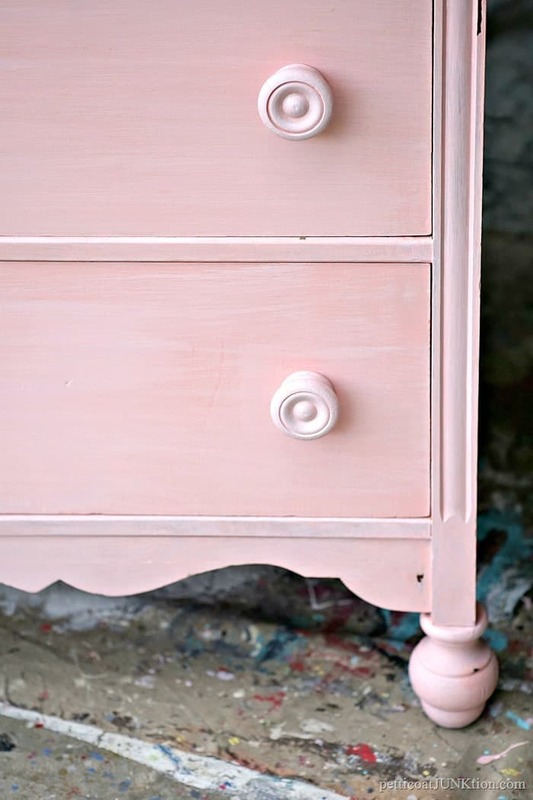 Annie Sloan owns the trademark “chalk paint”. Very pretty!!! Wish I could sell my girls on pink now, haha! We’re going to have to do a little drawer lining for sure around here! Thanks for the inspiration! I have to find that paint! Thanks. That piece is SWEET! What a beautiful color! I’m just lovin’ the pink vibe and how it reminds me of my favorite pink peonies that are coming soon. Yay! So pretty, Kathy.